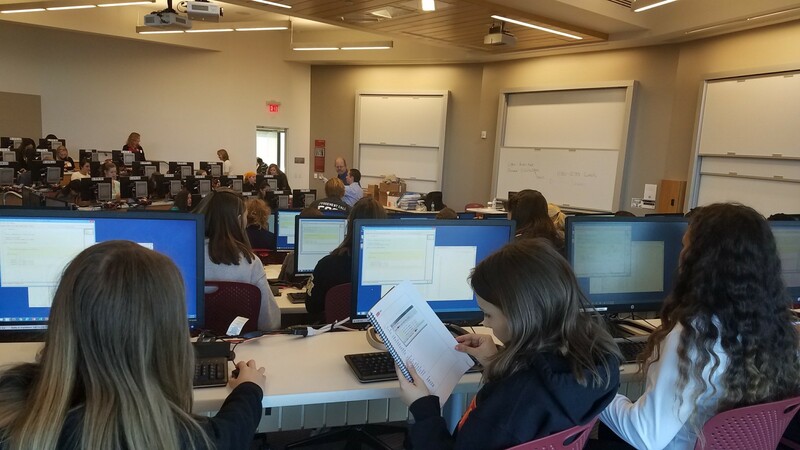 October 27, 2017 was our second annual U Girls Code event at University of Utah. The idea for this event came from Tyra Crockett, from Oracle Academy, and I. We convinced University of Utah’s TEK Club to host the event as it is good exposure for their program to have the girls in a university setting. Oracle Academy used our event last year as a prototype to take across the country in support of the Let Girls Learn initiative from the White House. Now with one year under our belts, we were ready with ideas to make this year’s event even better! 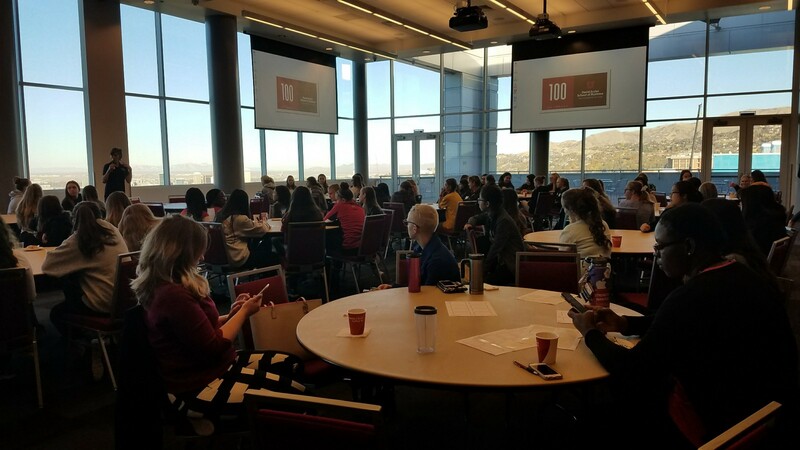 This year’s U Girls Code event began with a light breakfast and keynote in an event hall with great views at the top of the Spencer Fox Eccles Business Building. I was the keynote speaker, hoping to inspire the girls to be a coder like me. Since it’s hard to keep young minds’ attention for long, I kept my keynote speech to under 10 minutes talking about what I like most about working in tech, how I got into this field, and some tips for when you feel like maybe you don’t know as much about coding as the person next to you in class. Next, we took all 75 girls to a computer lab to get started in Greenfoot. Oracle Academy’s teachers, Lisa & Bruce, introduced the girls to what Greenfoot is and how to find it on the computers. The girls were instructed to use their workbook to work at their own pace to create an arcade game. Immediately the girls were helping each other and working excitedly through the content. The curriculum was structured so that they would write a few lines of code then try it so they got to see the progress as the game came together. They were giggling and really enjoying seeing what they created. I had never used Greenfoot before but it’s java based so it wasn’t tough for me to quickly pick it up and be able to answer questions. Some girls would ask what certain lines of code were doing and others typed furiously just trying to get their game created without understanding the code. Most encountered errors in their typing such as missing semicolons and they were quickly learning how to troubleshoot each other’s code. 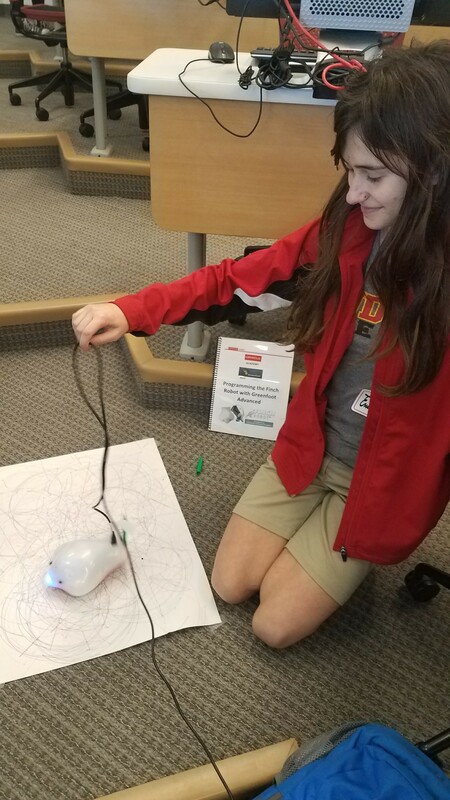 After lunch, the girls had the opportunity to work with Finch Robots using Greenfoot. 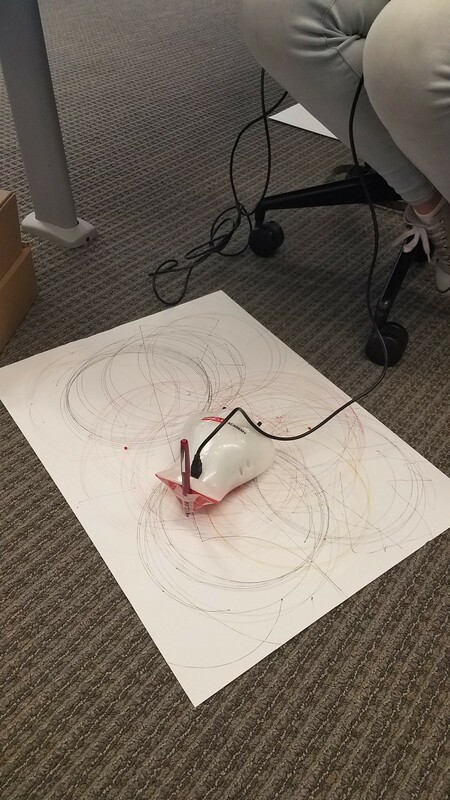 They attached markers on the robots to draw patterns on a piece of paper. They really enjoyed seeing what changing their code would do to the design the robot would draw! In the end, the girls said they had a fun day. When asked how many wanted to continue coding, most raised their hands. The highlight of the day for me was when one girl told me that I inspired her and she wants to be just like me! Without the support of Oracle Academy, University of Utah and Utah Oracle Users Group, this day would not have been possible. Thank you for providing the opportunity to show these girls that coding is fun and something they should consider as a career!